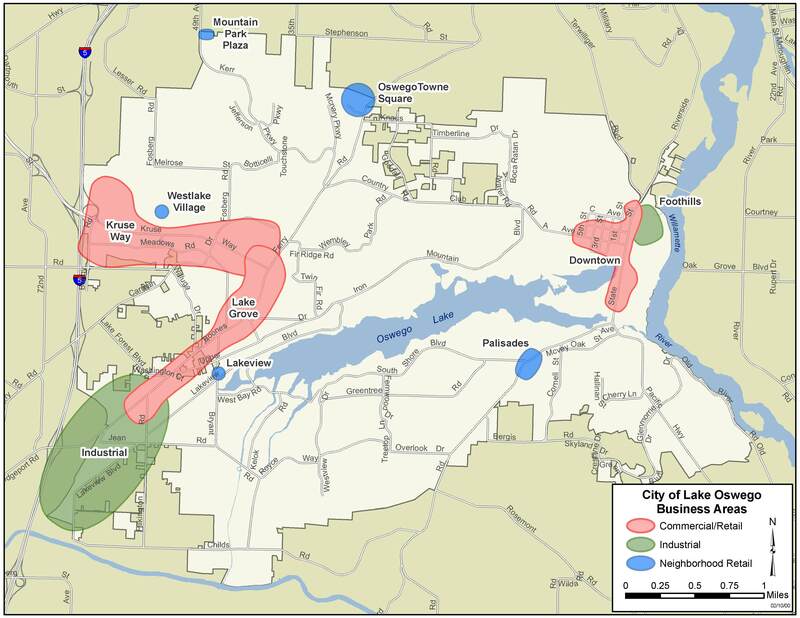 The City of Lake Oswego has eight different commercial zones and two industrial zones (view Business District Map). In addition to these base zones, certain commercial properties may be further regulated by Planned Development standards (Westlake, Mountain Park) or overlay districts (Lake Grove Village Center, West Lake Grove Design District, Downtown Redevelopment Design District). Each zone allows a different mix and size of uses and has different site development standards. Consult the City of Lake Oswego's Zoning Map and Community Development Code to learn about designated zones and uses around town. Before purchasing property in Lake Oswego or signing a lease, please consult with the Community Development Department at 503-635-0290 regarding the allowed uses on a particular site and additional development regulations. The Lake Oswego Code requires anyone who conducts business within the City to have a business license, including proprietors of home occupation. New businesses may also require land use review by Planning if there is an intensification of the use, exterior changes are proposed, or the new business requires a Conditional Use Permit (CUP), among other things.